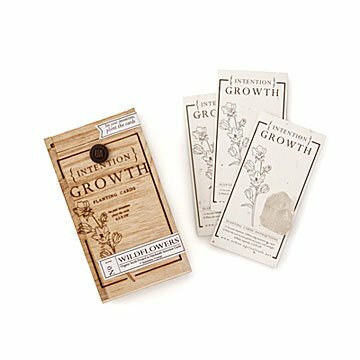 Write an intention on these cards, plant them, and watch them sprout with colorful wildflowers. There is nothing more magical than wishing on the wispy seeds of a dandelion—until now. These paper cards and wishing stones turn positive intentions and dreams for the future into a sprinkling of colorful wildflowers. Here's how it works: Write a wish on the card, plant it and the included crystal in your garden or a pot, and water it. In about a week, little green shoots (and maybe a hint of magic) spring up, allowing your dreams to bloom outside and in. There's probably a person you thought of when you read this. They might need an encouraging boost, or maybe they're bursting with wishes. Either way, we hope they'll find it as enchanting as we do. Made in California. Loved the packaging and the recipient of the gift was very happy with it.